Communication creates culture. That means that communication professionals are very much in charge of shaping employee perceptions—which are a big part of a movement known as the Employee Experience. Otherwise known as EX, it has been trending in corporate circles since around 2013. Since then, it has become abundantly clear that a well-considered and wisely implemented strategy in regard to EX—one that takes into consideration employee perceptions as well as environmental factors in the workplace and a consumer-style approach to HR—leads to greater levels of employee engagement, enthusiasm, involvement, retention, and employer brand commitment. Communicators also understand better than most how the workplace environment affects communication. They know that in an era when workers are becoming increasingly decentralized, access to information and the ability to share and interact with it must be mobile and possible from anywhere. As for tools . . .
Communicators, not to mention anyone with a smartphone, have surely taken note of the disparity between the apps they use for business and the ones they use in their personal lives. With the average US consumer spending as many as 60 hours per week on their digital devices, it’s no surprise that they’ve come to expect that intelligently designed, practical software should be available in every area of their lives. Enterprise communication professionals have driven the adoption of BYOD policies in the workplace and have pushed the idea that the digital tools provided to employees need to be consumer-grade in order to have maximum relevance. Communicators know that any digital tool made available to workers must work as well if not better than the mobile tools (in other words, apps) that they know and love from their non-working lives. 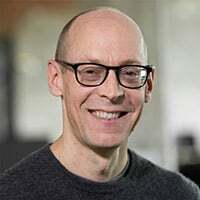 Unfortunately, enterprise-grade software has never been synonymous with style and efficiency, but that is not to say that enterprise organizations shouldn’t make it a priority to find software solutions that do their best to match the user-centric sophistication and elegance of consumer-grade tools. Good communicators utilize every tool at their disposal, and none more so than the smartphone. As a result, Internal Communication departments in many large organizations are getting better at optimizing their digital workplace experience for mobile devices. These improvements have been driven by a combination of responsive design, a proliferation of third-party apps for popular platforms, such as Microsoft Teams and other Office 365 tools, and a new generation of native apps designed specifically for internal communication. And while we would argue that it’s not a great idea, some organizations have gone so far as to make their own specific apps for remote employees working in the field, on the sales or factory floor, or out on the road. Today, mobile accessibility is often a major part of a digital workplace or digital transformation strategy, the result being that fewer mobile apps and shadow IT projects are being developed through skunkworks (great word!) projects. But despite these advances, most organizations are still failing to exploit the full potential of enabling mobile-first experiences for their employees. For digital channels aimed at workers, too many companies continue to put mobile second to the desktop experience, or force it to stand apart from the rest of the digital workplace. Communicators who grasp the opportunities of developing a truly mobile-first digital workplace are taking a more strategic view when considering mobile apps and integrating them into the existing digital workplace.They know that being able to work from anywhere is now essential. News feeds are the preferred way to consume work-related content, especially on mobile. Even more important is that this content be targeted for maximum practicality, relevance, and engagement. Everyone should have the opportunity to create content. Likewise, when employees know who’s behind the content being shared, they can connect with it in a more meaningful way. The mobile experience means having the capacity for instant messaging, Push Notifications, and Interactive features (likes, comments, and shares). An effective comms platform must be multimedia ready (photos and video must be easily shareable). 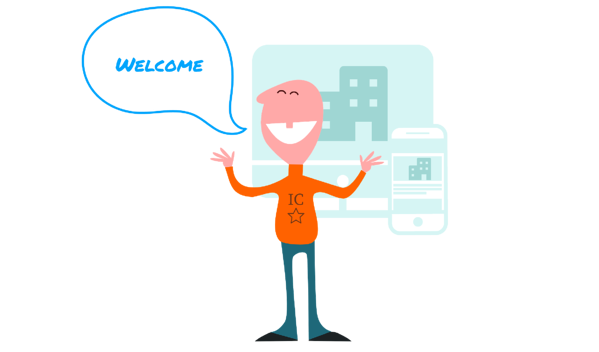 More and more internal communicators are getting involved in how their organizations approach intranet and digital workplace initiatives. This is a positive shift, because communicators are likely to take a nontraditional approach when it comes to how technology should be implemented. Intranet managers are starting to define the requirements of their intranet based on why employees need certain tools and capabilities, rather than making assumptions based on the technologies they already have in place, or the opinion of their IT departments. Taking this kind of purpose-based approach to choosing the tools of a digital workplace is crucial to determining how they can make sense for all employees. Many companies use a popular range of applications within Microsoft Office 365—including SharePoint, Yammer, and Teams. Ideally, such digital tools allow organizations to communicate with their employees in a more personalized and collaborative way, grow thriving internal communities, and revitalize their intranets. But in fact they have many limitations. The problem is that while these tools are great for top-down groups, bottom-up communities, and individual teams, they aren’t designed to reach and align large numbers of employee across an organization—be they at a desk, in the field, or on the road. Additionally problematic is that these tools aren’t particularly facile and intuitive to use, nor were they designed to be mobile-first, integrable, available in multiple languages, and custom-branded. 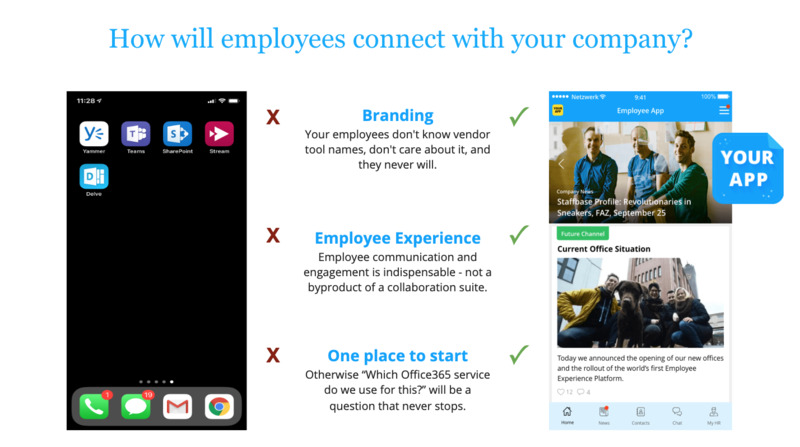 When communicators ask themselves how employees will connect with their company, it’s clear that an Office 365 solution can be fragmented and confusing. “Which Office 365 service do we use for which task?” is a question one never stops hearing. If only there were a welcoming front door for all employees to enter their digital workplace, no matter where they are in the world. Wait a minute, there is? Creating a mobile gateway with targeted, worldwide reach is the best way to enable communication in every direction among large groups of employees. A mobile intranet with communication at its center will provide an effective structure that can let workers know which tools are best suited to helping them do their jobs and when it's best to use them. It can also ensure proper governance. A growing number of enterprise organizations are using employee apps as a portal to their digital workplace, through which various tools—like the Office 365 applications they’ve mandated for their employees—can be integrated. These tools and services can be organized and accessed via mobile devices, wherever and whenever, and they have the additional benefit of building employee engagement by meeting a wide range of relevant communication needs and streamlining necessary HR processes. Another huge benefit is that a mobile employee communication platform can allow companies to target specific applications, be they Office 365 or other enterprise tools, to the employees who need them most. This can result in the saving of many thousands of dollars in costly license fees that would otherwise be spent giving workers access to tools they simply don't need. The bottom line is that as digital tools continue to proliferate in the workplace, making them available behind a front-door intranet that also serves as a mobile hub for your crucial comms and services is a great way to increase employee engagement and productivity, thus unlocking additional business value. So while we're on the subject of what it truly means to engage employees, what are some of the key requirements? No one knows better than communication pros that creating messages that are truly dynamic, impactful, and engaging totally depends on utilizing every tool available in the digital workplace. Video, in particular, is one of the most effective tools for communication that businesses have at their disposal. Great communicators know that inspiring people takes more than giving them facts and figures, they must be taken on a journey. Everyone loves a good story, and the best stories have real power. Through stories, employees can find motivation and purpose, and they can likewise be encouraged to find and tell inspiring stories of their own. Personal storytelling has the power to spark insight, meaning, and innovation—especially in the modern workplace where data and information have all too often overshadowed knowledge and wisdom. We know you've heard it a million times, but only because it bears repeating. Different employees have different internal communication needs based on their location, role, age, experience, involvement in specific projects, etc. But getting a message across to an entire workforce means finding ways to transcend even these kinds of markers. In other words, the traditional method of dividing your company up by departments or office locations is no longer totally effective. Internal communicators understand that their audience is made up of individuals, and they now have the tools at their disposal that allow them to specifically target an internal audience and avoid a “one size fits all” communication strategy that ultimately often misses the mark. So how can you individually target your entire workforce? One of the more effective methods is to create personas within your organization. Personas can help you effectively communicate with various groups, no matter where they happen to be in your organizational hierarchy. Having such specific information can turn communication around. Instead of the traditional top-down structure that informs workers about what management thinks they should know, companies can instead provide news and information that individual employees will find truly useful and meaningful. 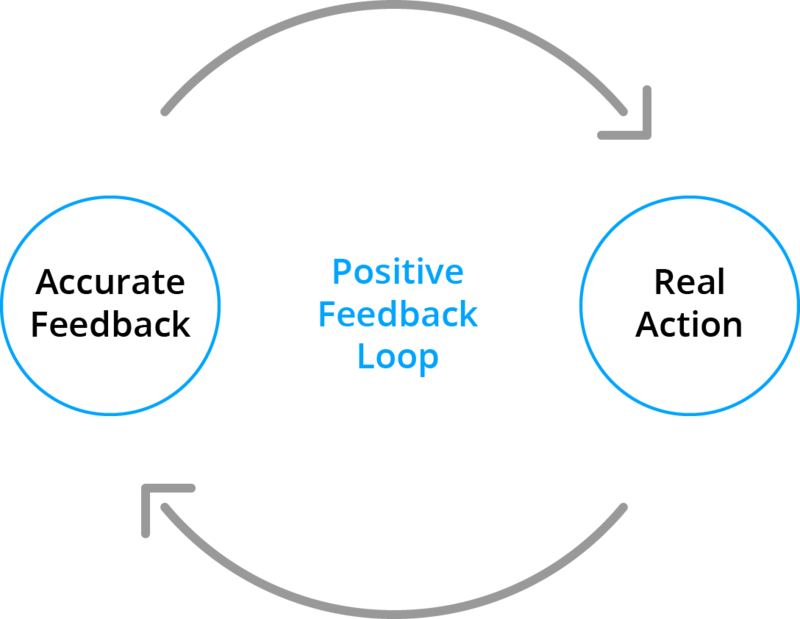 Not only will this boost a staff member’s interaction with his or her organization, but it means that they can provide accurate feedback that can lead to real action. Communicators write, create, and speak for a living. But to prove the value of your internal communication, increase budgets, and show results, you need real data to make your case. Luckily, collecting that data is easier than ever before. Through continuous monitoring and assessment of metrics over time, communicators will be able to observe changes in employee behavior and better understand the value of their internal communications strategy. The goal of Internal Communications, apart from transmitting information, is to engage and motivate employees with the messages they share. 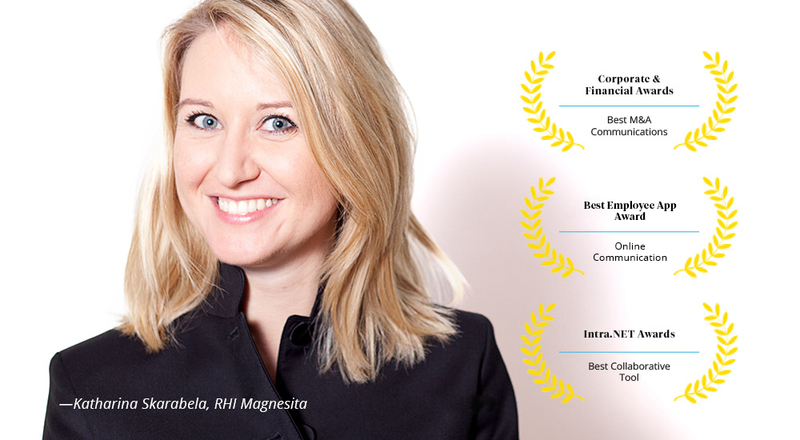 As for HR, their aim isn’t just hiring people, but to keep them happy and engaged once they’re onboard. Working together gives IC and HR an opportunity to double the effort to create employee engagement, simply by realizing their shared goals. Don’t forget, Human Resources talks to employees A LOT. Something Internal Communications also wants to do. And since both departments address employee concerns in the workplace, it only makes sense for them to do it together. Especially if a company is experiencing a merger or is facing any kind crisis , HR and Internal Comms are the departments on the front lines. Working together makes this battle a little bit easier. HR is the department that works the closest with an organization’s employees, no matter their title, rank, or seniority. HR also has the the strongest grip on employee demographics, enabling them to help discern the proper tone for effective communication and giving them them great insight into the essential needs of its people. All of which is information that Internal Comms can also benefit from knowing. Internal communicators must work effectively with all departments within their organization. The benefits of working closely with HR is that not only can you share long-term initiatives like fostering employee engagement, but that you also get a more accurate picture of the audience with whom you’re attempting to communicate.